Venice Art Crawl Mixer at The Terrace This Evening! - Yo! Venice! Home Venice Beach Art Venice Art Crawl Mixer at The Terrace This Evening! Venice Art Crawl Mixer at The Terrace This Evening! 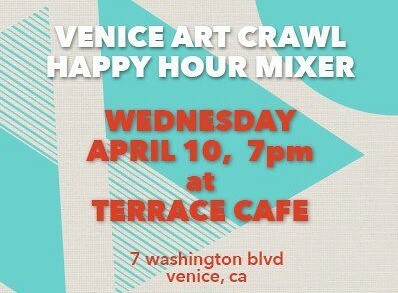 The Venice Art Crawl will host a networking mixer at The Terrace Café this evening starting at 7pm! Get a jump start on the next Crawl, coming up June 20! If you are new to the Venice art community this is a great way to get involved. If you are a veteran VAC member come hang out and brainstorm our next moves for summer! Any questions you have about the Art Crawl can be answered here!